In the media, not least on these pages, Arena of Valor has garnered considerable attention. It's not unwarranted. The game has been nothing less than a phenomenon in China, where it's known as Honor of Kings. This is where the majority of its reported $1.9 billion revenues for 2017 came from. These kinds of revenues inevitably turn heads, and the world watched with interest as Tencent began to roll out the MOBA worldwide at the end of 2017. But another mobile MOBA from a Chinese company, Moonton's Mobile Legends, has drawn attention primarily for controversial reasons after being the subject of a lawsuit from League of Legends developer Riot Games in July 2017. Despite this, Mobile Legends was Indonesia's highest-ranked mobile game for both downloads and grossing in January 2018. It far outperformed Arena of Valor in Southeast Asia's biggest mobile games market. Is this story being repeated elsewhere in the world, and does Mobile Legends deserve more credit? We'll begin by looking at the US, a major audience for PC-based MOBAs and esports, and a key target market for any mobile game of this nature. It would have been a simply implausible target for Arena of Valor to replicate its Chinese success in the US, and so it has proved. It ranked at 502nd in the US iPhone grossing charts as of March 6th 2018, according to App Annie. It's highest all-time position in the US charts was 43rd on January 13th, though this seems anomalous for a game that has spent the past few months bobbing somewhere between 300th and 500th. But it's worth remembering that Arena of Valor has only been out in the US since December 19th, so there remains time for it to gather momentum. Launched back in 2016, Mobile Legends has had longer to bed in. On the other hand, it's also had to hang in there and remain relevant for longer, which is no mean feat. All things considered, then, it's impressive to see that Mobile Legends is outperforming Arena of Valor in the US by a long distance, ranking at 124th in the grossing charts as of March 6th. The game has ranked in the top 200 for much of 2018 so far, ranking inside the top 100 as recently as February 23rd. Turning our attention to Europe, we previously highlighted that Arena of Valor was performing promisingly in Spain as of October. And it's still doing well there, ranking in the country's top 200 grossing for all but three days of 2018 so far. On February 19th, it hit 27th. As of March 6th, it's at 160th. But Mobile Legends is grossing well in Spain too, also dropping out of the top 200 only three times this year. 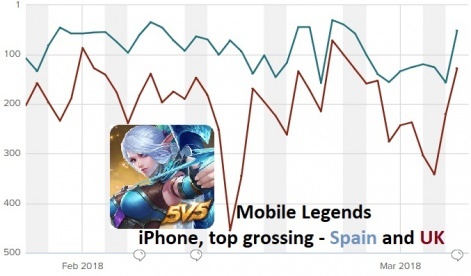 In fact, the two are almost impossible to separate; Mobile Legends' all-time highest grossing position in Spain is 11th, while Arena of Valor's is 10th. 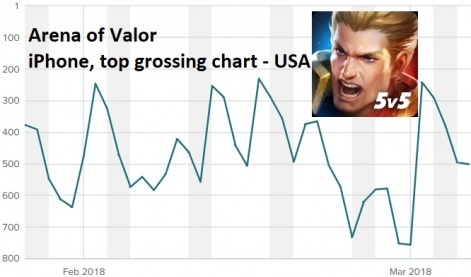 This makes Spain one of only nine countries in which Arena of Valor (the Western release) has entered the grossing chart's top 10. Another is the UK, where Tencent's game hit sixth on January 13th. However, that peak was something of a bolt from the blue. In general, Arena of Valor has been unspectacular in the UK, ranking at 335th as of March 6th. Meanwhile, Mobile Legends (which has enjoyed top 10 grossing chart positions in 79 countries, nabbing top spot in 20) is a much more solid performer in the UK. It's highest ever grossing rank in the country, 39th, is lower, but it's been far more consistent in 2018 so far. It's spent much of its time in the top 200, entering the top 100 twice this year. As of March 6th, it sits at 128th. But while Mobile Legends unquestionably dominates the market in Indonesia, it's worth checking the state of play elsewhere in Southeast Asia. 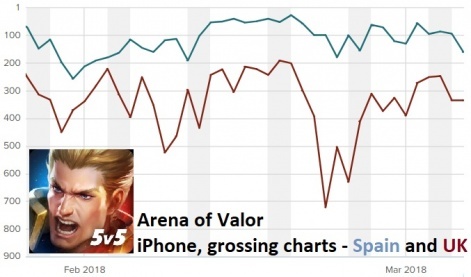 For example, Arena of Valor's Vietnamese localisation by Singaporean publisher Garena Online has been a massive success, spending all of 2018 so far among the country's top 10 grossing iPhone apps. For five straight days between February 16th and 20th, the game was unchallenged at number one. 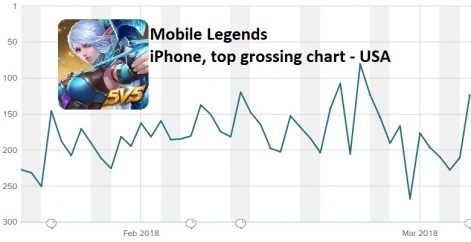 Meanwhile, Mobile Legends has mostly figured within the top 100 on Vietnam's iPhone grossing chart throughout 2018 so far, but its highest ranking of fifth came more than a year ago in February 2017. The conclusion, then, is certainly not that Arena of Valor is dead in the water, nor that Mobile Legends is universally performing better. No, the only real conclusion can be that there is increasingly strong competition in the mobile MOBA space – which can only be healthy for a genre so rich in potential.